The threat posed by antibiotic resistant bacteria is a pressing issue which must be addressed. It is difficult and expensive to develop new antibiotics, so our project is designed to make currently available antibiotics useful again. Our aim is to create a toolkit to re-sensitise pathogens to antibiotics using CRISPR and a two-phage system, based on work by Yosef et al. (2015, doi:10.1073/pnas.1500107112). An engineered lysogenic phage will transfer a CRISPR system to its host bacterium, designed to cleave resistance genes and also confer protection from an engineered lytic phage. When this lytic phage is added to the population, it kills any bacteria that have not been successfully re-sensitised. We chose to target genes found in the highly-resistant ESKAPE pathogens, and worked with 4 different phages - P1, λ (lambda), T4 and T7. Our system was modelled in silico and tested empirically on a specially designed E. coli testing platform. Antibiotic-resistant bacteria pose an enormous threat to our current way of life. Antibiotic resistance already causes over 700,000 deaths per year, and this number is expected to rise to a terrifying 10 million per year by 2050 (Figure 1) (O’Neill, 2014). A solution to this problem is urgently needed and we believe that synthetic biology could be the key, which is why we chose to tackle antibiotic resistance with our iGEM project. Antibiotic resistance can arise in a number of ways, such as spontaneous mutations or horizontal gene transfer. When a population is exposed to antibiotics, susceptible individuals are killed and any resistant bacteria survive to repopulate the niche. Every time a population is exposed to an antibiotic, a selection pressure is applied and resistant bacteria dominate the population (Levy, 1998). Two of the major factors contributing to the rise of resistant bacteria are the overuse and misuse of antibiotics. Examples of overuse include the prescription of antibiotics in cases where the infection is minor and will clear up without medical intervention (Levy, 1998). Antibiotics are also heavily overused in agricultural settings. A staggering 80% of antibiotics purchased in America are used on livestock (Bartlett et al., 2013), encouraging the growth of resistant bacteria and risking their spread through the food chain (Wright, 2010). Misuse includes the prescription of antibiotics for viral infections, and patients stopping their course of antibiotics before the recommended time (Levy, 1998). Despite the ever-increasing number of antibiotics that are no longer effective against many pathogens, there is a lack of new antibiotics being developed. This is because development is incredibly costly (Sukkar, 2013) and there’s no guarantee that pharmaceutical companies will recoup these costs through profit, as resistance can arise in a matter of months (Bartlett et al., 2013). Even if new antibiotics are developed, they can only stave off the antibiotic resistance crisis for so long. Instead, alternative strategies are required. 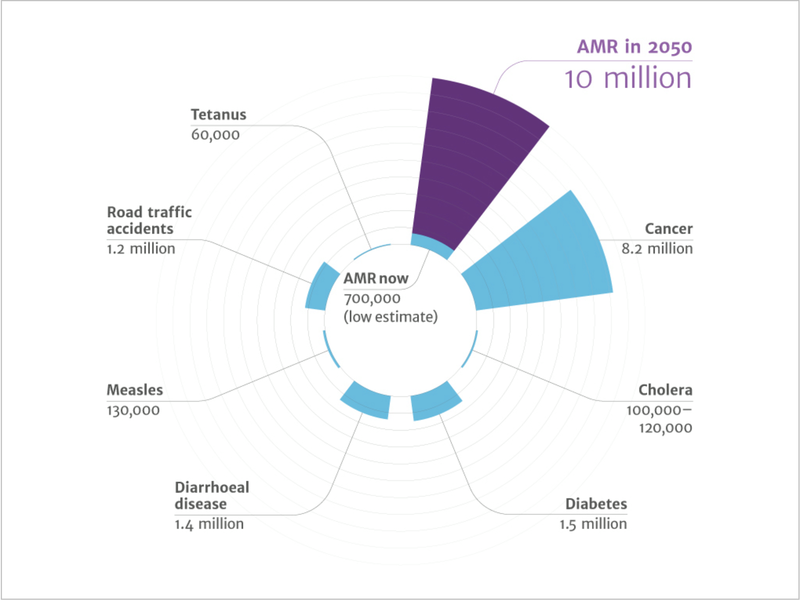 Figure 1: The number of deaths currently caused by and predicted to be caused by AMR in the future, compared to other significant causes of death. Figure from O’Neill, 2014. Bacteriophages (phages) are the most abundant life-form on the planet, with an estimated population of 10^32. Phages are viruses that infect bacteria, and they are incredibly specific – each species of phage only infects particular species or even strains of bacteria (Wittebole et al., 2014). 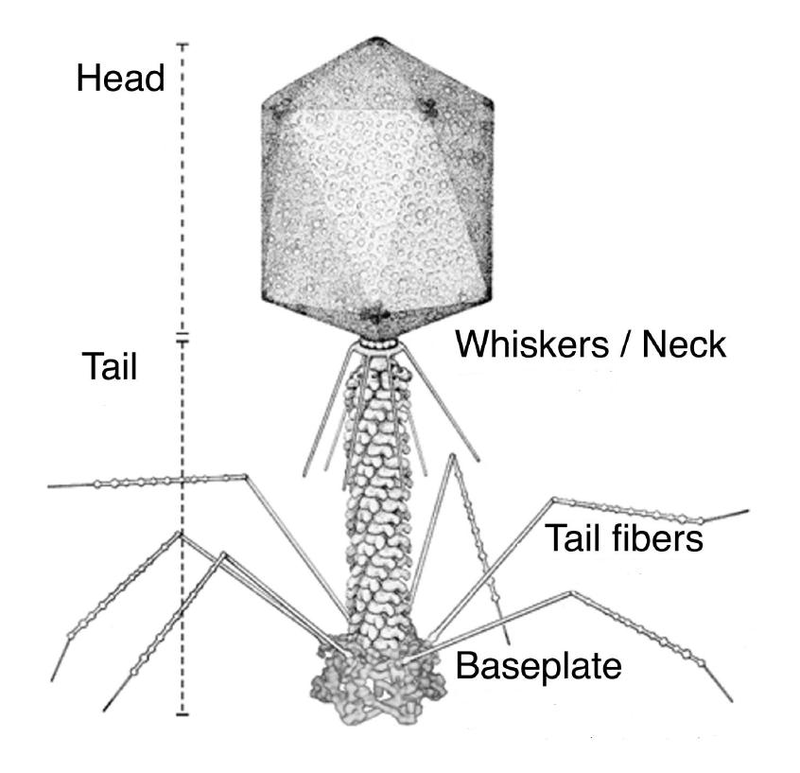 Typical phage structure consists of an icosahedral “head” and a cylindrical “tail” (Figure 2). The phages DNA – which can be single or double stranded – is packaged within the head. Upon recognition of specific receptors on the host cell surface, the phage injects its DNA into the host bacterium via the tail structure (Montag et al., 1987; Klug & Huxley, 1971). Once inside the bacterium, the phage enters one of two possible lifecycles. During the lysogenic cycle, the phage genome lies dormant and is replicated along with the host DNA and spreading to bacterial daughter cells. The phage genome may integrate into the host genome (as in λ phages) or form a separate plasmid (as in P1 phages) (Wittebole et al., 2014). The change from the lysogenic to the lytic cycle may be triggered by an external stimulus such as temperature or UV light, but some phages experience only the lytic cycle without the lysogenic. In the lytic stage, phages hijack the host’s cell machinery and resources and replicate themselves rapidly until they reach a critical population size – prompting the lysis of the host bacterium (Wittebole et al., 2014). Figure 2: The structure of a T4 bacteriophage. Figure from Miller et al., 2003. Lytic bacteriophages have been used as a treatment against bacterial infections since the early 20th century, but they fell out of fashion by the 1940s when antibiotics were invented and the comparable efficacy of phages was called into question (Sulakvelidze et al., 2001). So-called “phage therapy” involves the in vivo use of phages to kill pathogenic bacteria. Phage therapy is advantageous over broad spectrum antibiotics in several ways. Its specificity for particular bacteria reduces the negative impact of treatment on the patient microbiome (Drulis-Kawa et al., 2012), and studies have shown that resistance to phages is less likely to develop than antibiotic resistance (Nobrega et al., 2015). However, there are also a number of difficulties with phage therapy. Current legislation is not set up to deal with administration of phages to patients – it is based upon antibiotics with detailed structures and known activities but many phages are poorly characterised and their behaviour hard to predict (Cooper, Mirzaei and Nilsson, 2016). The in vivo nature of phage therapy comes with the risk of the patient recognising the phages as foreign and removing them before they can kill the pathogen (Wittebole et al., 2014), or the triggering of an aggressive immune response which can harm the patient (Pires et al., 2016). To overcome these problems, an ex vivo approach should be considered. CRISPR (Clustered Regularly Interspaced Short Palindromic Repeat) systems and CRISPR-associated (Cas) proteins are a component of the bacterial adaptive immune system, providing protection against foreign DNA such as that from bacteriophages (Qi et al., 2014). The CRISPR array contains palindromic DNA repeat sequences which flank ‘spacers’ – regions of DNA which have been associated with foreign bacteriophage DNA (Barrangou et al., 2007). The array becomes transcribed into mRNA to produce ‘guide RNA’ (gRNA), which is associated with an endonuclease such as Cas9 (Bikard et al., 2012). If DNA containing the homologous sequence to the spacer (referred to as a ‘protospacer’, normally 20-30 nt) appears in the cell, the gRNA will guide the Cas9 to the foreign DNA and bind to the complementary site. The Cas9 will then cleave and destroy the foreign DNA if there is a 2-6 bp protospacer adjacent motif (PAM) sequence next to the protospacer site (Figure 3) (Barrangou et al., 2007). Spacers can be engineered to target almost any part of the genome - including antibiotic resistance genes. Somewhat ironically, CRISPR systems targeting antibiotic resistance genes have been recently integrated into lysogenic bacteriophages. When the engineered phage genome is injected into the host, the CRISPR system becomes active and will target the desired genes. Studies by Citorik et al. (2014) and Bikard et al. (2014) successfully demonstrated the use of this system to re-sensitise pathogens to antibiotics by cleaving plasmid-mediated resistance genes. One weakness of this single-phage system is that any bacteria that are resistant to the lysogenic phage will have a selective advantage over their re-sensitised counterparts. Antibiotic treatment will result in the phage-resistant bacteria becoming dominant in the population, in the same manner as antibiotic-resistant bacteria. To overcome this selection pressure for resistance, Yosef et al. (2015) developed a dual phage system. After the initial re-sensitisation by the lysogenic CRISPR-containing phage, the bacteria are then exposed to a lytic phage. This lytic phage is engineered to contain the same resistance gene protospacers that are targeted by the CRISPR system, meaning that any bacteria that have been successfully re-sensitised will also be immune to infection by the lytic phage. The system therefore provides a selective advantage to re-sensitised bacteria, reducing the likelihood that resistance to the lysogenic phage will develop. 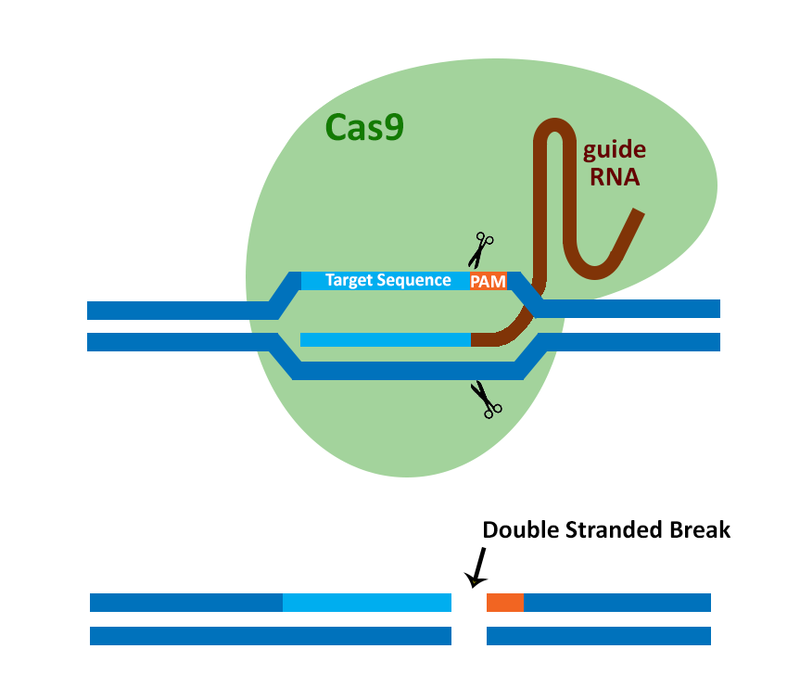 Figure 3: CRISPR-Cas results in double stranded break at the site recognized by guide RNA. Figure taken from the abm website. We based our project on the work of Yosef et al. (2015), and aimed to expand their ideas to create a toolkit for bacterial re-sensitisation. We planned to use two species of lysogenic phage, two species of lytic phage, three CRISPR systems and two target genes (Figure 4). Because we planned to use an E. coli testing platform, we chose phages that were specific for E. coli. Our lysogenic phages were λ and P1, and our lytic phages were T4 and T7. We chose the λ and T7 phages as these were previously used successfully by Yosef et al. (2015), so we knew it was possible to create a working system with these phages. P1 was chosen as it is a well-characterised phage, with a high efficiency of packaging and more than twice the head capacity of λ (Trempy et al., 2004). Any cells lysogenised with P1 gain resistance to T7 (Goodgal, 1956). In an ideal scenario this would not be a problem, as all lysogenised cells should contain a CRISPR system and thus should be resistant to T7 anyway. However, in practice it is possible for a cell to be lysogenised but for the CRISPR system to be non-functional, so that the cell retains antibiotic resistance but cannot be killed by T7. For this reason, we chose an additional lytic phage – T4. Like T7, T4 is a purely lytic phage with no lysogenic stage (Miller et al., 2003). T7 and T4 are both well-characterised model species, though to our knowledge T4 has not previously been engineered using BRED (Bacteriophage Recombineering of Electroporated DNA). We decided to target two genes, which together allow us to target all members of the prominent ESKAPE group of resistant pathogens. This group has been singled out as the most important players in nosocomial infections, due to their ability to 'escape' the effects of antibiotics. The ESKAPE group consists of Enterococcus faecium, Staphylococcus aureus, Klebsiella pneumoniae, Acinetobacter baumannii, Pseudomonas aeruginosa, and Enterobacter spp (Rice, 2008). The blaKPC (KPC) gene codes for Klebsiella pneumoniae carbapenemases, and has been found in a number of Gram negative pathogens including the 4 in the ESKAPE group (KAPE) (Arnold et al., 2011; Robledo et al., 2011; Marchaim et al., 2008). KPC confers resistance to a number of β-lactam antibiotics including the carbapenems, which had previously been relied upon as a “last resort” antibiotic for use when others fail (Tzouvelekis, 2012). Similarly to the other ESKAPE pathogens, KPC has a large global distribution (Figure 5). The vanA gene confers resistance to glycopeptide drugs such as vancomycin, and is commonly associated with the Gram positive species vancomycin-resistant Staphylococcus aureus (VRSA) and vancomycin-resistant enterococci (VRE) – the ES of ESKAPE (Willems et al., 2005; Haenni et al., 2009). We also identified mecA (associated with methicillin-resistant Staphylococcus aureus, MRSA) (Wielders et al., 2002) and ampC (a β-lactamase gene found in Gram negative ESKAPE pathogens) (Jacoby, 2009) as potential targets for future expansion of the toolkit. Figure 5: Global spread of KPC, since publication it has also been discovered in Africa. Figure from (Nordmann 2011). We chose to use three CRISPR systems in our project: the cas9 systems from Staphylococcus aureus (SaCas9) and Streptococcus pyogenes (SpCas9) and the Cpf1 system from Francisella novicida (FnCpf1). Due to IP issues with our collaborators, the SpCas9 work will not be discussed. The SaCas9 protein is only 1053 amino acids in length – much smaller than both Cpf1 and SpCas9 (SaCas9’s better-known Streptococcus pyogenes equivalent) (Friedland et al., 2015). Its small size is advantageous to us, as bacteriophages are limited in terms of the amount of DNA that can be packaged in their heads. SaCas9 is a type II CRISPR system, and works as described above. Its PAM sequence is G-rich and located downstream to the protospacer recognition site (Fagerlund et al., 2015). FnCpf1 is a type V CRISPR system, so differs slightly from SaCas9 in a number of respects. It leaves a staggered cut rather than a blunt double-stranded break (Doudna, 2015) and has a T-rich PAM located upstream to the protospacer recognition site (Fagerlund et al., 2015). The differing PAMs of our three CRISPR systems expand the range of potential target sequences. The FnCpf1 system does not require a tracrRNA and has a much shorter crRNA than its cas9 counterparts, making it cheaper and simpler to produce (Fagerlund et al., 2015). Arnold, R.S. et al., Emergence of Klebsiella pneumoniae Carbapenemase-Producing Bacteria. Southern Medical Journal 104, 40-45 (2011). Barrangou, R. et al., CRISPR provides acquired resistance against viruses in prokaryotes. Science 315, 1709-1712 (2007). Bartlett, J.G., Gilbert, D.N., Spellberg, B. Seven Ways to Preserve the Miracle of Antibiotics. Clinical Infectious Diseases 56, 1445-1450 (2013). Bikard, D., Hatoum-Aslan, A., Mucida, D., Marraffini, L.A., CRISPR Interference Can Prevent Natural Transformation and Virulence Acquisition during In Vivo Bacterial Infection. Cell Host & Microbe 12, 177-186 (2012). Bikard, D. et al. Development of sequence-specific antimicrobials based on programmable CRISPR-Cas nucleases. Nat. Biotechnol. 32, 1146–1150 (2014). Citorik, R. J., Mimee, M. & Lu, T. K. Sequence-specific antimicrobials using efficiently delivered RNA-guided nucleases. Nat. Biotechnol. 32, 1141–1145 (2014). Cooper, C. J., Mirzaei, M. K. and Nilsson, A. S. (2016) ‘Adapting drug approval pathways for bacteriophage-based therapeutics’, Frontiers in Microbiology. Frontiers Media SA, p. 1209. doi: 10.3389/fmicb.2016.01209. Doudna, J. (2015). Genome-editing revolution: My whirlwind year with CRISPR. Nature, 528(7583), 469-71. Drulis-Kawa, Z., Majkowska-Skrobek, G., Maciejewska, B., Delattre, A.S., Lavigne, R. Learning from Bacteriophages - Advantages and Limitations of Phage and Phage-Encoded Protein Applications. Current Protein & Peptide Science 13, 699-722 (2012). Fagerlund, R. D., Staals, R. H., Fineran, P. C. 2015. The Cpf1 CRISPR-Cas protein expands genome-editing tools. Genome biology. 16(1). pp. 251-253. Friedland, A. E., Baral, R., Singhal, P., Loveluck, K., Shen, S., Sanchez, M., ... & Kornepati, A. V. 2015. Characterization of Staphylococcus aureus Cas9: a smaller Cas9 for all-in-one adeno-associated virus delivery and paired nickase applications. Genome biology. 16(1). pp. 257- 268. Goodgal, S. H. Incorporation of Phage DNA on Lysogenization of Shigella Dysenteriae. Biochim. Biophys. Acta 19, 333–340 (1956). Haenni, M., et al. vanA in Enterococcus faecium, Enterococcus faecalis, and Enterococcus casseliflavus Detected in French Cattle. Foodborne Pathogens and Disease 6, 1107-1111 (2009). Jacoby, G. A. AmpC β-Lactamases. Clin. Microbiol. Rev. 22, 161–182 (2009). Klug, H.E., Huxley, A. A Discussion on new developments in electron microscopy with special emphasis on their application in biology - Application of optical diffraction to helical structures in the bacteriophage tail. - Philosophical Transactions of the Royal Society of London. B, Biological Sciences, 181. (1971). Levy, S. B. The Challenge of Antibiotic Resistance. Sci. Am. 46–53 (1998). Marchaim, D., Navon-Venezia, S., Schwaber, M.J., Carmeli, Y. Isolation of imipenem-resistant Enterobacter species: Emergence of KPC-2 carbapenemase, molecular characterization, epidemiology, and outcomes. Antimicrobial Agents and Chemotherapy 52, 1413-1418 (2008). Miller, E.S. et al., Bacteriophage T4 genome. Microbiology and Molecular Biology Reviews 67, 86 (2003). Montag, D., Riede, I., Eschbach, M.L., Degen, M., Henning, U. Receptor-Recognizing Proteins Of T-Even Type Bacteriophage - Constant And Hypervariable Regions And An Unusual Case Of Evolution. Journal of Molecular Biology 196, 165-174 (1987). Nobrega, F.L., Costa, A.R., Kluskens, L.D., Azeredo, J. Revisiting phage therapy: new applications for old resources. Trends in Microbiology 23, 185-191 (2015). O’Neill, J. Review on Antimicrobial Resistance: Antimicrobial Resistance: Tackling a Crisis for the Health and Wealth of Nations. London: Review on Antimicrobial Resistance. (2014). O’Neill, J. Tackling drug-resistant infections globally: final report and recommendations, The Review on Antimicrobial Resistance. London: Review on Antimicrobial Resistance. doi: 10.1016/j.jpha.2015.11.005. (2016). Pires, P. B. et al. Genetically Engineered Phages: a Review of Advances over the Last Decade, American Society for Microbiology 80, 523-543 (2016). Rice, L.B. Federal funding for the study of antimicrobial resistance in nosocomial pathogens: No ESKAPE. Journal of Infectious Diseases 197, 1079-1081 (2008). Robledo, I.E., Aquino, E.E., Vazquez, G.J. Detection of the KPC Gene in Escherichia coli, Klebsiella pneumoniae, Pseudomonas aeruginosa, and Acinetobacter baumannii during a PCR-Based Nosocomial Surveillance Study in Puerto Rico. Antimicrobial Agents and Chemotherapy 55, 2968-2970 (2011). Sukkar, E. 2013. Why are there so few antibiotics in the research and development pipeline? The Pharmaceutical Journal. 291(13). Pp.520. Sulakvelidze, A. et al. (2001) ‘Bacteriophage therapy.’, Antimicrobial agents and chemotherapy. American Society for Microbiology (ASM), 45(3), pp. 649–59. doi: 10.1128/AAC.45.3.649-659.2001. Trempy, J, E., Trun, N. 2004. Chapter 7 Bacteriophage. In: Trempy, J, E., Trun, N. eds. Fundamental Bacterial Genetics. Blackwell Science Ltd. pp.105-125. Tzouvelekis, L.S., Markogiannakis, A., Psichogiou, M., Tassios, P.T., Daikos, G.L. Carbapenemases in Klebsiella pneumoniae and Other Enterobacteriaceae: an Evolving Crisis of Global Dimensions. Clinical Microbiology Reviews 25, 682-+ (2012). Wielders, C. L. C., Fluit, A. C., Brisse, S., Verhoef, J. & Schmitz, F. J. mecA Gene Is Widely Disseminated in Staphylococcus aureus Population. J. Clin. Microbiol. 40, 3970–3975 (2002). Willems, R.J.L., et al. Global spread of vancomycin-resistant Enterococcus faecium from distinct nosocomial genetic complex. Emerging Infectious Diseases 11, 821-828 (2005). Wittebole, X., Roock, S. De & Opal, S. M. A historical overview of bacteriophage therapy as an alternative to antibiotics for the treatment of bacterial pathogens. Virulence 5, 226–235 (2014). Wright, G.D. Antibiotic resistance in the environment: a link to the clinic? Current Opinion in Microbiology 13, 589-594 (2010). Yosef, I., Manor, M., Kiro, R. & Qimron, U. Temperate and lytic bacteriophages programmed to sensitize and kill antibiotic-resistant bacteria. Proc. Natl. Acad. Sci. 112, 7267–7272 (2015).